In this article, you’ll find all the info about the costs of living and backpacking in Morocco. Morocco is quickly becoming a popular backpacking destination. Its popularity comes from its close proximity to Europe and low-budget flights reaching this country every day. I spent a year traveling all over Morocco, hitchhiking to popular destinations like Fez, Marrakesh, and Tangier and to off the beaten path places like the Akchour waterfalls. Morocco is an ideal backpacker’s destination. Not only is it the perfect destination for hikes, culture, and history lovers, it’s also very cheap to travel and live here. While I was living in this gorgeous country I did countless border runs to extend my travel visa for Morocco and it’s one of the cheapest countries I’ve been to so far considering my travel style. 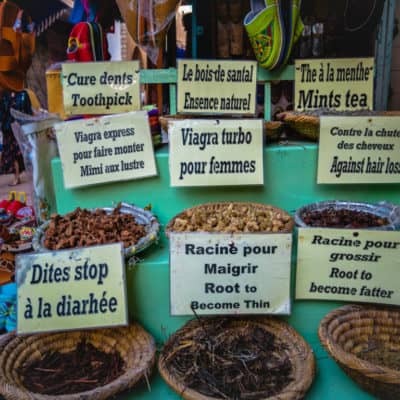 Since prices in Morocco vary so much depending on your travel style, writing a post about the exact costs of travel, or life in this country is a bit difficult. It really depends on the way you like to travel. If you are a budget backpacker, it’s easy to find a dorm bed in a popular city between $5 and $10 dollars a night and it’s possible to spend less than 2 dollars on a meal. 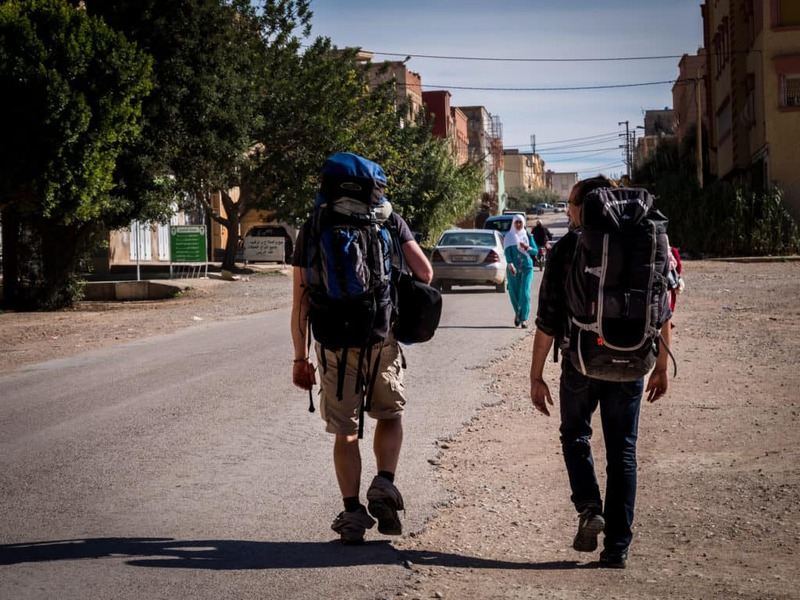 Hitchhiking and camping are also very common and quite popular in Morocco so it’s possible to cut on your transportation and accommodation budget massively. 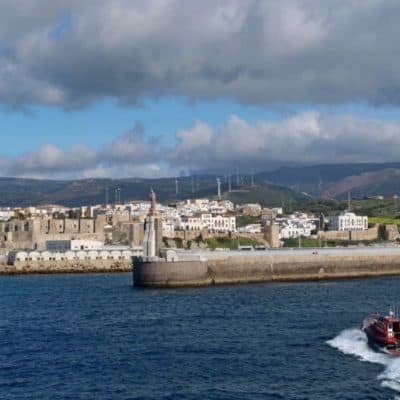 Morocco can be super cheap but if luxury travel is more your thing, the country also offers the most luxurious and lavish lifestyle money can afford. So, is Morocco an expensive country? For me, it was a cheap destination where I could save money while traveling and do tons of fun activities like visiting traditional music festivals, seeing beautiful waterfalls and spend a few nights in the Sahara desert. 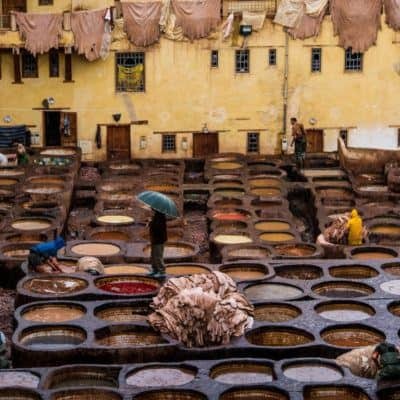 This article is a breakdown of the living and travel costs in Morocco, written with the average budget backpacker in mind. How much does accommodation in Morocco cost? How much does food in Morocco cost? Late spring, summer, and early autumn is a perfect time to camp in the pristine countryside of Morocco. Winter camping in this country, however, is not ideal as the northern part of the country becomes very rainy during the winter months and the south is much colder at night due to the arid desert-like landscapes. 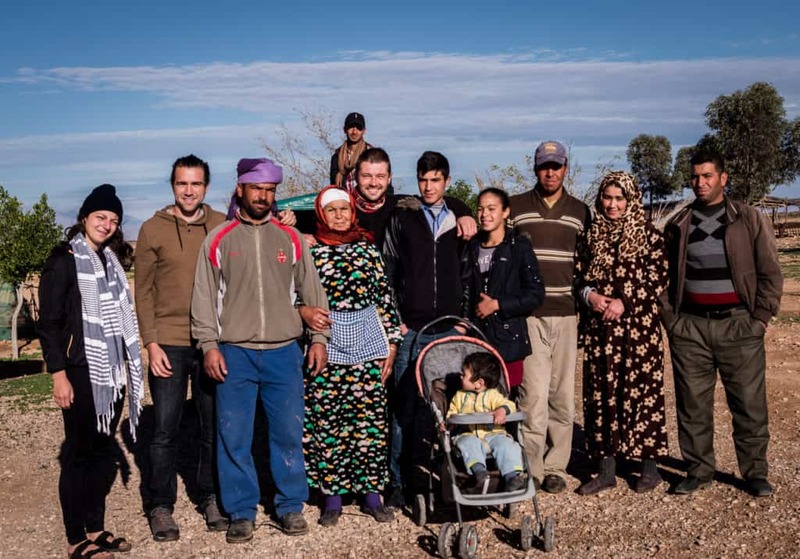 In Morocco you can pitch your tent almost everywhere for free, however, a bit of discretion is advised as commercial campgrounds are quite popular and people will want you to pitch your tent there instead (for which you will have to pay). Camping is actually so popular during the warmer months of summer that you will be able to find clean and well-maintained budget campsites near almost every bigger city. If you want to have more amenities such as hot showers, public car parks, and electrical hookups than it’s much better to stay in these. On Booking.com you can find a list of popular campsites and campgrounds all over Morocco starting from $5 a night and going all the way towards the more luxurious end. Hostels are always very cheap and ideal if you travel by yourself in this North-African country. 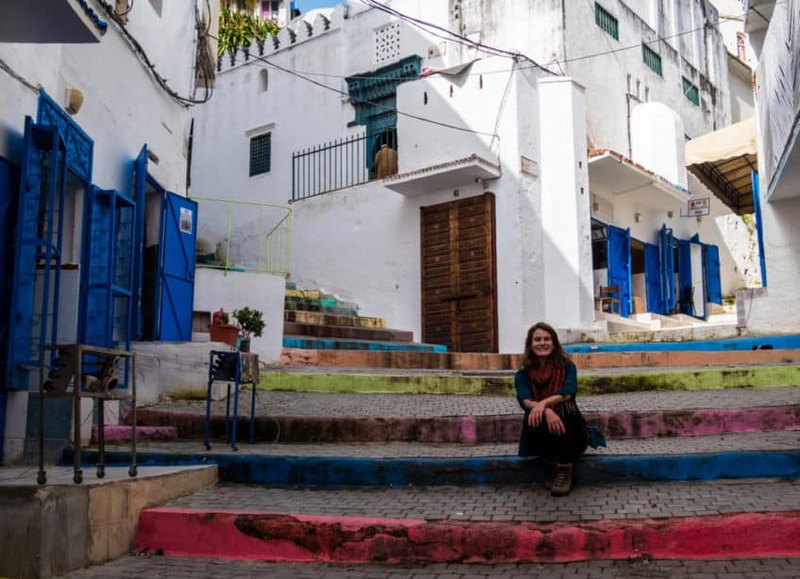 Morocco offers a huge choice of hostels for budget travelers who want to save money to explore during the day, and swap stories with fellow backpackers in the shared kitchen or bar in the evening. On Booking.com you can find a bed in a mixed dorm room starting from $5 per night, even in touristic cities such as Tangier, Fez or Marrakesh. In case you can’t find a hostel in the town you travel to or you want the comfort of your own private room and bathroom right in the heart of the old Kasbah of a popular Moroccan city, then staying in a guesthouse, homestay or renting a room or apartment on Airbnb might be a better option, especially when you are traveling with a partner or friend. Staying at a Riad is such a typical Moroccan experience that no visit to the country would be complete without spending at least a night in one. Riads are a type of building that started appearing during the Idrisid dynasty. They usually have indoor courtyards with gardens and fountains. One notable feature of their construction is that they are designed with zellij, Moroccan tiles. Usually, they can be found in major cities such as Fez, Marrakesh, and Tangier. The price of a night for two in a Riad starts around $60 so it isn’t really a budget backpacker friendly option. However, I decided to include this option in my guide since, in my opinion, its the hallmark of a trip to Morocco. Booking.com has a wide selection of luxurious yet affordable Riads where you could stay all over Morocco. Renting an apartment in Morocco in big cities can be relatively cheap although it depends on where you are and in which time of the year you’re starting to rent. Our suggestion is to look for housing before or after the high season (May – September) as the prices will be lower. Although apartments in Morocco on Airbnb can be quite expensive, most hosts give a good discount if you rent per month. It’s also possible to send them a private message and negotiate the monthly price, especially when you want to rent the flat during low-season. Get your discount for Airbnb here. There are a few Facebook groups on which you can find apartments and flats to rent and where you can also write a post with your preferences. 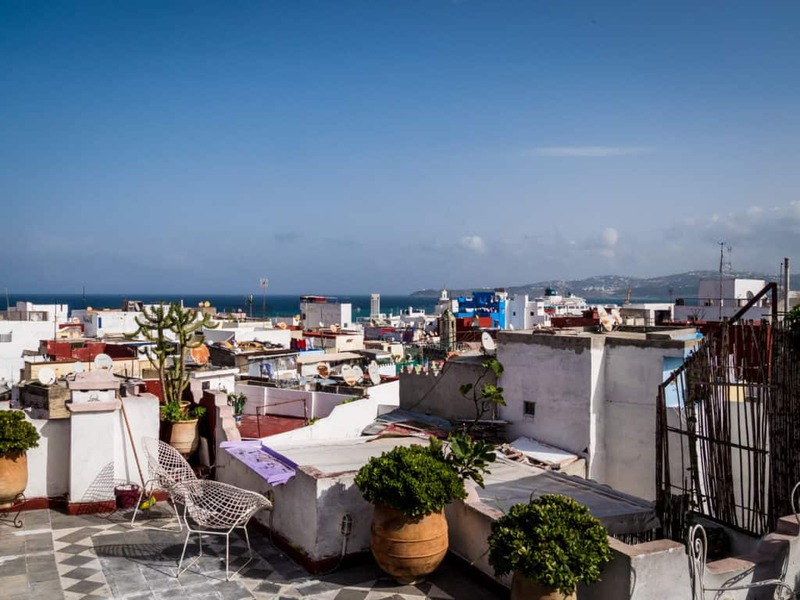 For example: “I’m looking for a one bedroom flat in the city center of Tangier for $250 per month”. You can also find people in these groups who are searching for a roommate. Another great Facebook group to join is the group Expats in Morocco. This group is comprised of thousands of expats living in Morocco and ready to offer their help and help you find a cheap apartment. You can also search for an apartment or house on this real estate website. 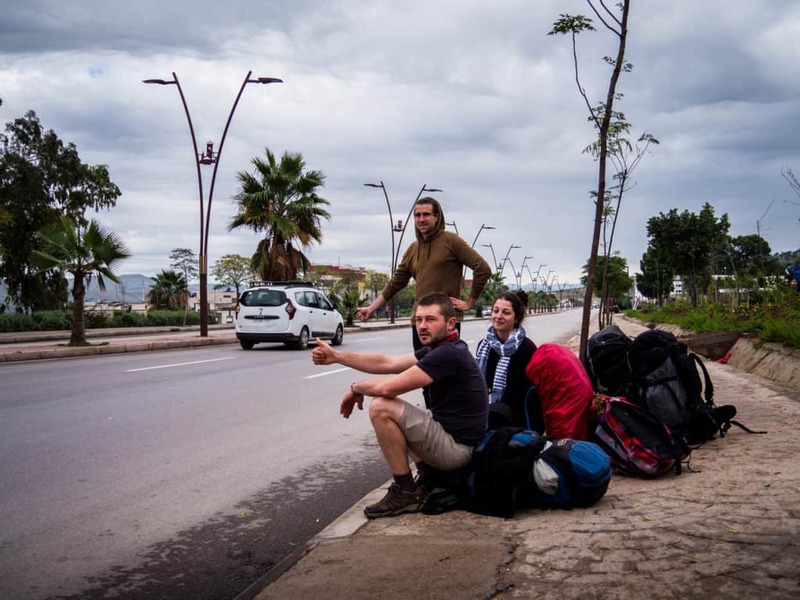 Hitchhiking in Morocco is very easy and fun. On our recent trip to Morocco, Cynthia and I never had to wait more than 20 minutes while hitchhiking. In Morocco, this is a great way to meet people who will often invite you to a meal or to drink a delicious Moroccan tea. One time a family even invited us to sleep over after treating us to a delicious lamb and olive Tajine. It’s a really adventurous and free way of getting around and a great way for me to practice my Arabic on a daily basis! Renting a car in Morocco isn’t only affordable but also very practical if you want to reach off-the-beaten-path and remote places. You can travel on your own tempo, camp along the way and you’ll see sides of the country that you wouldn’t if you’d be traveling by public transport. The price of renting a car per day depends on which city you’re renting it from. Check out the rates per city for renting a car here. 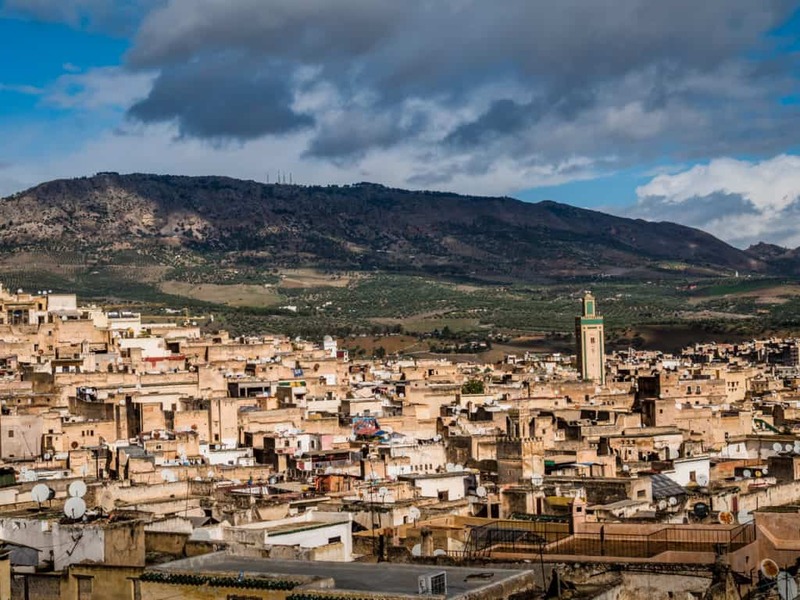 Getting around Morocco by train is a fabulous option because they’re not only cheap but also a great way to see the incredible Moroccan landscapes while being comfortably seated. I crossed a good part of the country from Fez to Tangier overnight in a train and had the chance to admire a wonderful sunrise from my train compartment in the morning. In Morocco, it’s very easy to buy your train tickets directly at the train station and most of the employees will have a good grasp of English. All the information on prices and timetables can be found on the ONCF website. Once you know which train you want to take, you can head over to the train station to buy your ticket there. Make sure to bring cash to buy your ticket as it’s not always possible to pay by debit or credit card. Prices vary quite a lot depending on where you want to go, the time of the year and whether you are taking an overnight or day train. Taking a train from Marrakesh to Casablanca, for example, can cost between 90 and 140 Dirhams. Getting around Morocco by bus is very cheap. There are so many bus companies competing that the prices are very low. Moroccan bus stations very often look like madhouses, with people running around calling the destinations of buses that are about to depart. Most Moroccan cities have a single central bus station also called la Gare Routière in French. 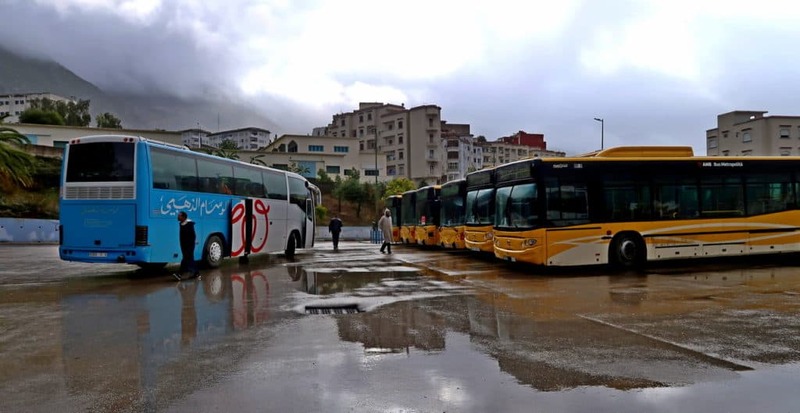 After traveling around Morocco using different bus companies and comparing them I realized that the price they charge does not vary that much from each other, however, some companies have buses that are much more comfortable than others. We once traveled with a cheap local bus company from Tangier to Chefchaouen in a bus that had no air conditioning. The road was so windy that some people got sick and vomited and I can assure you having air conditioning on the bus in such a situation would have been a stomach saver. I would recommend the CTM company for the extra comfort their buses provide. If you can’t buy from CTM because their tickets are sold out, I would recommend buying your ticket from a company called Nejme Chamal, they are the second best bus company in Morocco and also have very comfortable coaches. Bus travel is quite cheap especially if considering the distances being covered. The CTM fare from Casablanca to Marrakesh, for example, is only 90 Dirhams. Consider visiting the CTM website to have a list of their prices and schedules. It’s possible to find two types of Taxis in Morocco: Petit taxi (small taxi) and Grand taxi (big taxi). The Petits Taxis are usually smaller cars and are used to take short rides within the city. Their rates vary over Morocco, charging between 5 and 7 Dirhams per kilometer and they charge 50% more at night. Most big cities in Morocco suffer a constant shortage of taxis, so remember that you can always flag down a taxi that already has a few passengers but still has spare seats left. Always ask the driver to turn on the taximeter and if he doesn’t, just walk away and find another one. One good rule of thumb is that most rides within the city limits should cost between 10 and 15 Dirhams. Have a look on the Numbeo website to see what the current fares for small city taxis are. The Grand taxis are used to take long rides from city to city or from the airport to the city center. These cars are typically four-door Mercedes from the eighties without air conditioning. The Grand taxi is commonly a shared taxi in Morocco and will usually not leave the city before it’s full unless you want to have the entire taxi for yourself and pay for the 6 seats. They can be found at the port of coastal cities when arriving by ferry, waiting at the airport, at bus and train stations and at the bigger hotels in the cities. 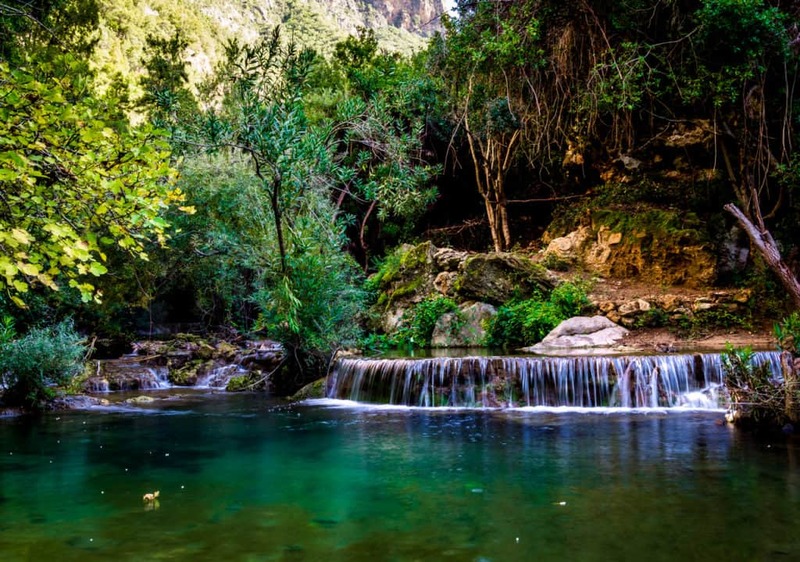 When we were in Chefchaouen, Cynthia and I used a shared Taxi to visit the Akchour waterfalls. We had to wait until it filled up before leaving but it only cost us 25 Dirhams each to cover the 45 kilometers distance between the city and the entrance of the waterfall park. Another great option to consider when traveling around Morocco is to take a domestic flight. 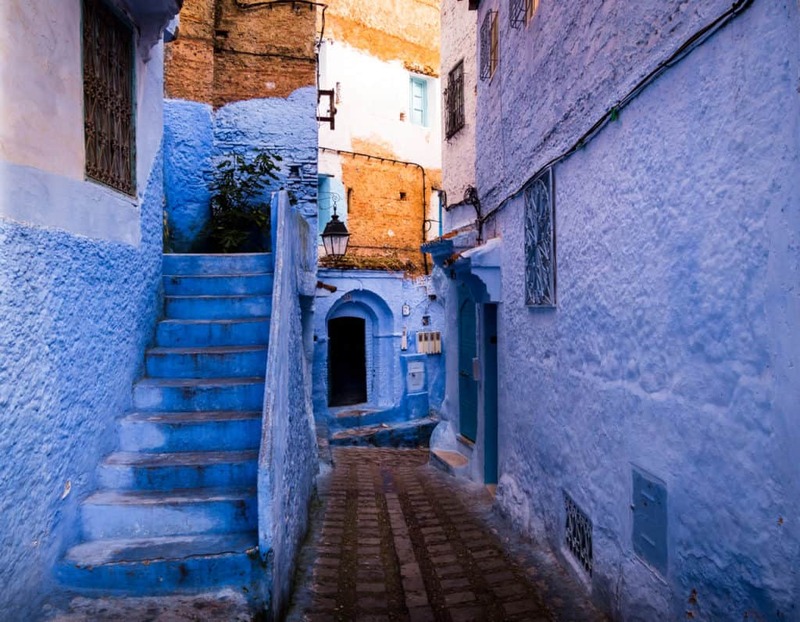 The flights in Morocco are often almost the same price or only slightly more expensive than making the same distance by train so it’s definitely worth checking them out if you are limited in time. The main domestic airline is Royal Air Maroc but it’s sometimes possible to find cheaper flights with other airlines as well. It doesn’t really matter where you are in the world, the cheapest way to eat is always by buying food from the local supermarkets and street stalls. 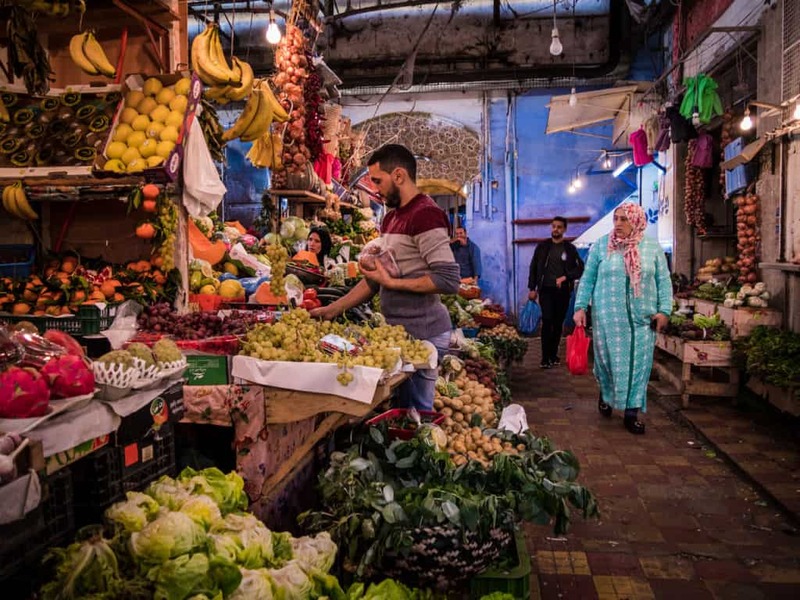 Buying food in the streets of Morocco is super cheap and there are plenty of open-air street markets in every town and city where it’s possible to buy delicious fruits and vegetables. Eating at restaurants is also quite cheap if you want to order a Tajine or Moroccan couscous. 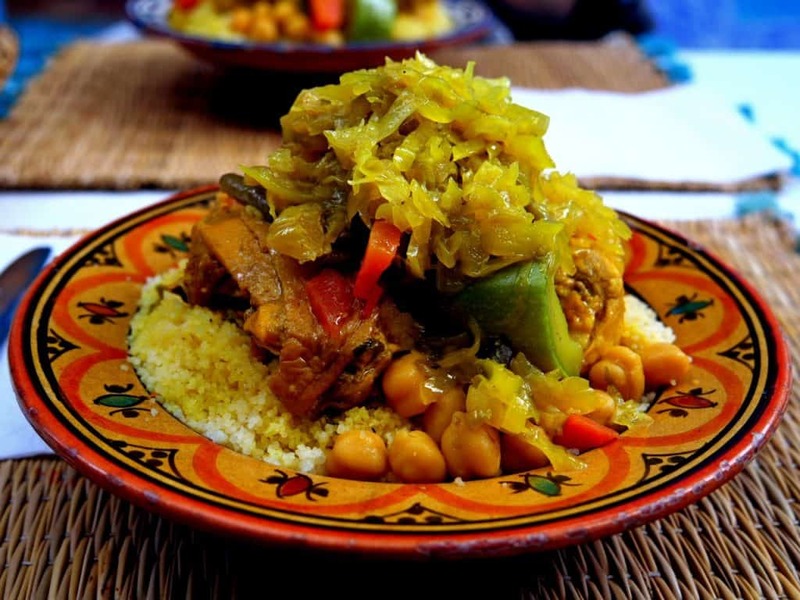 You absolutely have to try the delicious Moroccan cuisine! Here’s a break-down of the average costs of what we paid for shopping and eating in restaurants in Morocco. In conclusion, it’s possible to make your trip to Morocco as cheap or expensive as you want. 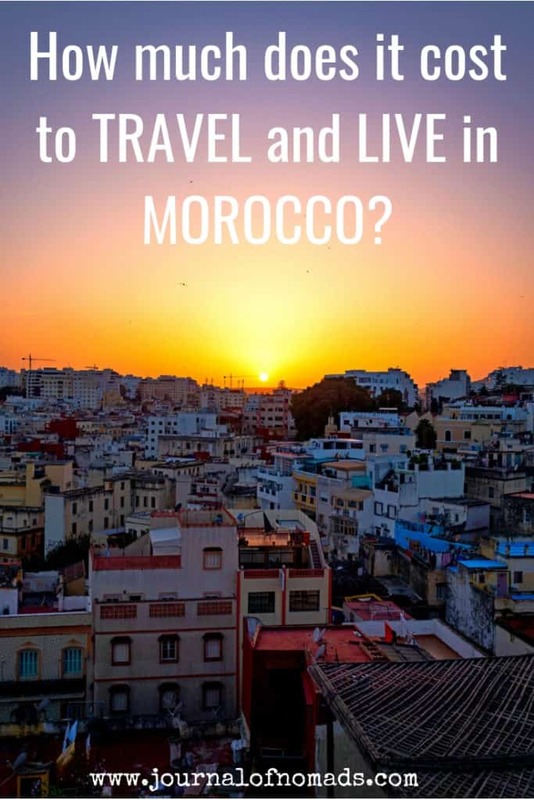 While we do enjoy spending a bit more in restaurants every so often ( it’s impossible to visit Morocco without trying those delicious Tajines ) we have been able to travel around the whole country and do a plethora of fun activities without breaking our piggy bank. Morocco is a great destination to travel and live for a long time without becoming broke and the perfect place to escape the cold in winter like we are doing now! We absolutely love Morocco so it’s not hard to write beautiful things about this country 🙂 Where have you been working in Morocco?